This topic discusses an advanced use of a Custom Control in a Grid component. The image below shows a grid based on the Invoice_header table from Alphasports. 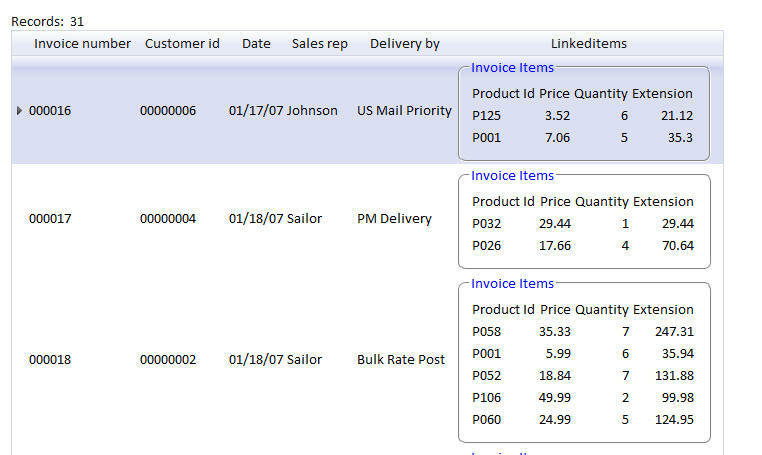 The last column on the Grid shows the line-items (from the Invoice_items table) for the current invoice. This data in this column is a custom control. Create a dummy calculated field. Does not matter what the calculated field is called. The image below shows how you can do this for .dbf tables. In the 'Xbasic function declarations' section, define the linkedRecords() function. Here is a version of this function for the case where you are working with DBF files. An example for SQL tables follows below. linkedRecords = "No records found"
dim html as c = ""
html  = "<table>" + crlf() + titles + crlf() + html + crlf() +  "</table>"
%html% + html +  "</fieldset>"
linkedRecords = "Error opening connection"
sql = "select * from invoice_items where Invoice_number = :whatInvNo"
linkedRecords = "Error executing query"
linkedRecords = "No records found." dim flagRecordsFound as l = .t. html = "<table>" + crlf() + titles + crlf() + html + crlf() + "</table>"
%html% + html + "</fieldset>"